MANILA, June 21 -- The Armed Forces of the Philippines (AFP) on Wednesday expressed gratitude to President Rodrigo Duterte for fulfilling his promise to use his presidential plane to ferry soldiers wounded in the battlefield. "I'd like to give notice that as the President has promised, for the use of his presidential aircraft last night on our way back to Manila from Cagayan de Oro and Iligan. Those who were required by our medical professionals to be evacuated to Manila, used the presidential aircraft and other aircraft of the Air Force to be transported to Manila," AFP spokesperson Brig, Gen. Restituto Padilla Jr. said at the Mindanao Hour press briefing in Malacañang. "A fulfillment of his commitment to have the presidential plane used by the soldiers. And we'd like to pass on the thanks of our Armed Forces on behalf of the Chief of Staff and the wounded warriors that we brought to Manila for further treatment," Padilla said. 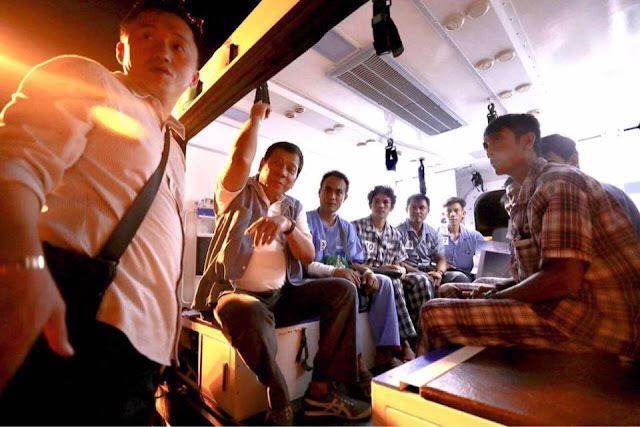 According to Palace officials, President Duterte took nine wounded soldiers with him aboard the F-28 presidential plane on the way to Manila after his visit to troops at Camp Evangelista in Cagayan de Oro City Tuesday night. The nine soldiers were among security forces battling terrorist in Marawi City. After winning the elections, Duterte said he wants all aircraft assigned to the Presidential Airlift Wing to be converted as "air ambulances".